Browntrout Sean Sanders’s homey, green-minded North Center restaurant may not look like much of a destination, nor does his menu read like a list of must-haves. But don’t be fooled: The food, while on the simpler side, is rife with flavors both big and nuanced. Sanders sources local ingredients—including arugula, tomatoes, zucchini, blueberries, gooseberries and grapes grown on his rooftop garden—to create one of the most seasonal (and ever-changing) menus in town. 4111 N Lincoln Ave (773-472-4111). El: Brown to Irving Park. Bus: 11, 50, 80. Average main course: $21. Carnivale Jerry Kleiner’s colorful—if slightly dated—design of this massive pan-Latino spot can make a person smile—and the mojitos and margaritas don’t hurt, either. You’ll find all sorts of variations on traditional Latino fare on the menu, like the grilled skirt steak arranchera and mini whitefish tacos. Many of the dishes are enhanced by Peruvian chili peppers, pineapple sage and heirloom tomatoes, which are grown on the restaurant’s rooftop garden. 702 W Fulton St (312-850-5005). El: Green, Pink to Clinton. Bus: 8, 65. Average main course: $24. Lockwood Two major changes have hit the Palmer House Hilton’s signature eatery these past few months. First, Greg Elliott, a chef with Naha and one sixtyblue on his résumé, took over the kitchen. 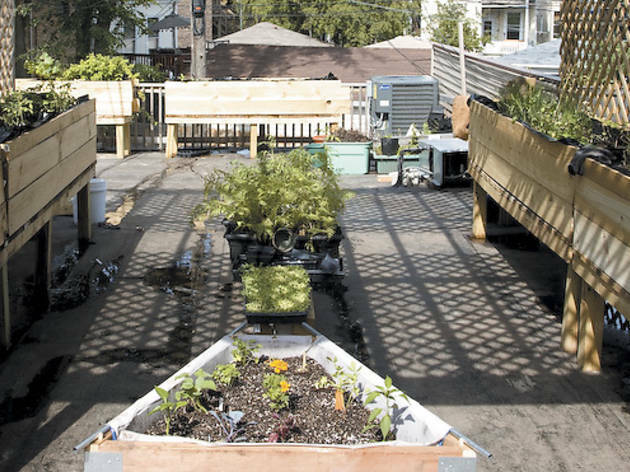 Then the restaurant installed a rooftop garden (now in its first growing season), where sous chef Val Benner oversees bell peppers, heirloom carrots, heirloom tomatoes, tons of herbs and, soon, beehives. 17 E Monroe St (312-917-3404). El: Brown, Green, Orange, Pink, Purple (rush hrs) to Adams/Wabash; Blue, Red to Monroe. Average main course: $30. Markethouse We realize you’re not likely to rush over to the DoubleTree for dinner (deep-pocketed remodeling or not) without the promise of deliciousness, so consider this an endorsement. Executive chef Scott Walton puts out flavorful, smart, well-executed comfort classics (think four-meat meatloaf) slightly updated with seasonal flair, thanks in part to the rooftop garden boasting herbs, a fig tree, several types of heirloom tomatoes and beans galore. 300 E Ohio St (312-224-2200). El: Red to Grand. Bus: 2, 3, 66, 157. Average main course: $26. 676 Restaurant and Bar True, this restaurant in the Omni Hotel might be geared toward tourists, who probably get a bigger kick out of the stunning Magnificent Mile views than we do. Nonetheless, you don’t have to be from Pittsburgh to enjoy a glass of wine and hyperlocal produce from the Omni’s fifth-floor rooftop garden, which grows an abundance of seasonal vegetables and herbs, such as peppers, radishes, heirloom tomatoes and several types of basil. 676 N Michigan Ave (312-944-7676). El: Red to Grand. Bus: 65, 145, 146, 147, 151. Average main course: $26. Uncommon Ground For its second location, Uncommon Ground went with a perfect space: a warm, log-cabinish room, and a roof sturdy enough to hold the 640-square-foot garden on top of it. 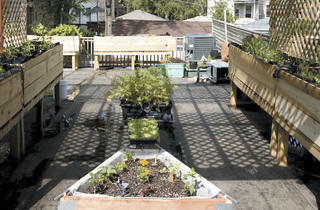 The restaurant grows vegetables and herbs including peas, spinach, mint, tomatoes, arugula, basil, kale and more on the roof, and many of those vegetables find their way into the seasonal eats on the menu. 1401 W Devon Ave (773-465-9801). El: Red to Loyola. Bus: 36, 147, 151, 155. Average main course: $17.